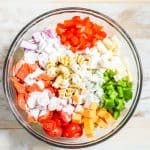 This easy Rotini Pasta Salad is a classic for picnics, potlucks, or an evening grilling out with family. 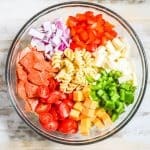 This salad mixes the BEST Italian dressing with rotini pasta, lots of veggies, cheeses, and savory pepperoni for the perfect hearty side dish. With only a handful of ingredients, and a few steps, this pasta salad can be ready and on the table in no time! This easy pasta salad is one I fall in love with over and over again each time I make it. It is so simple, you just forget how delicious it really is! 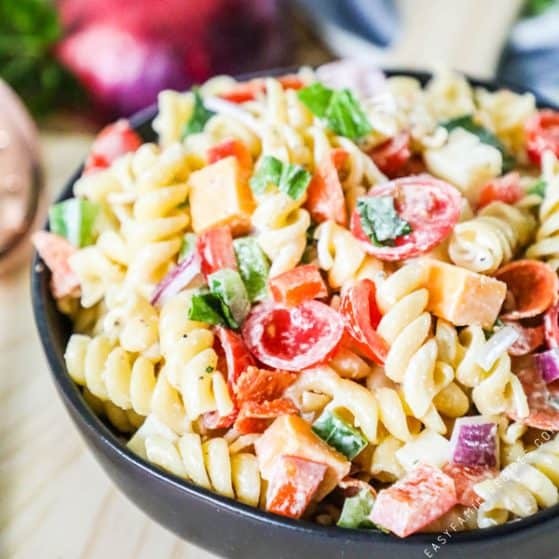 We make this salad with rotini pasta along with lots of veggies, cheeses, and pepperonis, then smother it in our very favorite Italian dressing to give it so much flavor it is almost unbelievable. One of the best parts about this salad is that you can add and subtract ingredients without worry to suit your tastes, or what you have available in your fridge. 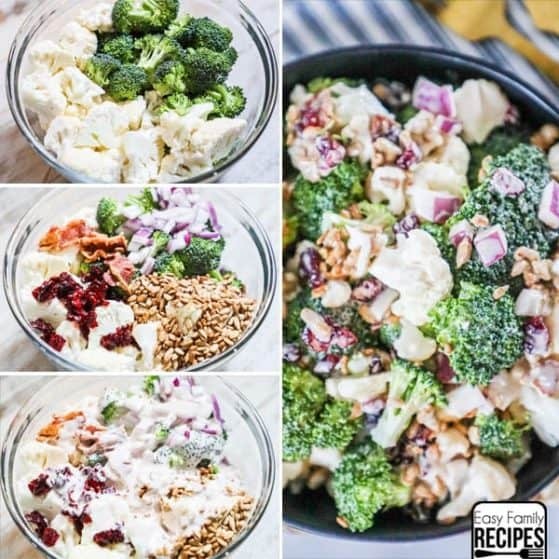 Almost all veggies, and cheeses, and meats would taste good in this salad so feel free to mix it up and try new combos, or just stick with the classic version! Traditionally, I serve this pasta salad as a side dish when we cook out or head to a potluck. It can also be a great lunch, or light dinner on it’s own. It goes well with both all american favorites and Italian dishes. Here are some of my favorite main dishes to serve rotini pasta salad on the side. Hopefully these ideas will get you on your way to a delicious meal. If you have a favorite dish you serve pasta salad with that I missed, let me know in the comments! I would love to give it a try! As promised, this pasta salad comes together quickly, and is exceptionally easy to make! I am going to walk through a few tips on making this salad, substitutions, and the ingredients I prefer here. Make sure to hop down to the bottom of this post for the full recipe card. Cook the rotini pasta per package directions. Drain pasta and run under cold water, then place pasta in a large bowl. 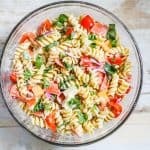 I prefer using rotini pasta for this pasta salad because the shape of the rotini gives it so many nooks and crannies to really soak up the dressing and helps it to become very flavorful. 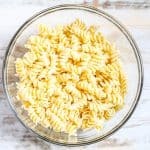 If you don’t have rotini on hand, you can substitute any pasta variety and it will work, but my preference is always rotini! After cooking the pasta, make sure to run it under cold water and toss it a bit. This will cool the pasta and prevent it from continuing to cook and becoming gummy. Once you cool the pasta, make sure to shake as much of the water off as you can, then transfer it to a large bowl that will give you enough room for all of the toppings and to toss everything together. While the pasta is cooking prep the remaining ingredients. When it is done, mix in the cheese, peppers, tomatoes, onion, pepperoni, and basil. Usually I chop all of the cheeses, meat, and veggies while the rotini cooks and it gives me just about the perfect amount of time. Make sure to chop the onion very small so that it can compliment the flavor without becoming overpowering. You can add additional cheeses, meat, and veggies, or omit any that you may not care for. Other veggies that go well in pasta salad are: broccoli florets, cauliflower, sweet peas, zucchini, and yellow squash. I highly recommend you try the homemade Italian Dressing to make this pasta salad. This Italian Dressing is a key flavor in the pasta salad, so it is important to use one that has a really great taste. This dressing is super quick and easy to make, and so worth the extra few minutes. 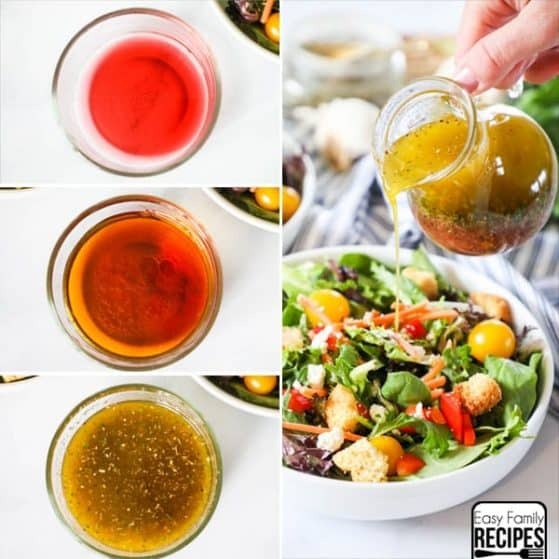 If are in a pinch, you can use bottled, but try to get a high quality, flavorful dressing so that you will still have great Italian flavors shining through. Serve immediately or chill, then toss before serving. Enjoy! You can serve this immediately, or prepare ahead of time then chill until time to serve. If you are making it more than 4-6 hours ahead, I would recommend following the prep ahead directions below. Can I make this pasta salad ahead of time? Cook pasta and store in the fridge in cold water. Prep all ingredients and store separately. Can I save the leftover Rotini Pasta Salad? Leftovers can be stored in an airtight container in the refrigerator for up to 3 days. This salad will not freeze well. How do I make Gluten Free Pasta Salad? This pasta can be made gluten free by using gluten free pasta. Please check packaging each individual ingredient to ensure compliance. I am going to a picnic, barbecue, potluck, brunch and need to feed a crowd, can I double this recipe? This recipe will feed about 12 as a side dish, but if you need more, you can easily double it just by doubling the ingredients in the recipe. If you don’t need so much, you can also easily cut the recipe in half to make less. If you enjoyed this Italian style Rotini Pasta Salad, I hope you will try some of our other delicious side dishes! 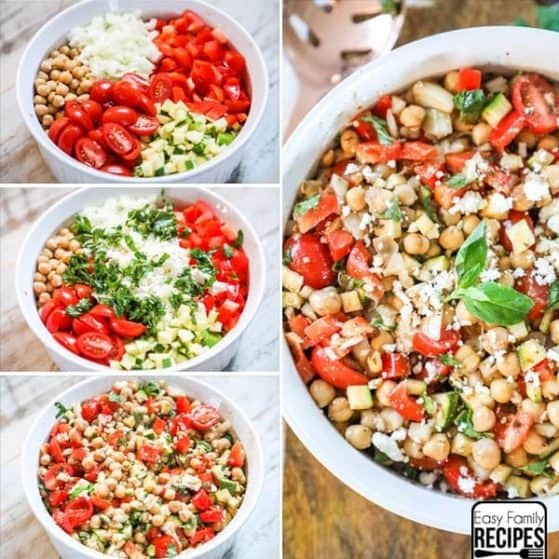 Mediterranean Chickpea Salad– Loaded with flavor! Restaurant Style Hashbrown Casserole– Best potluck side dish! 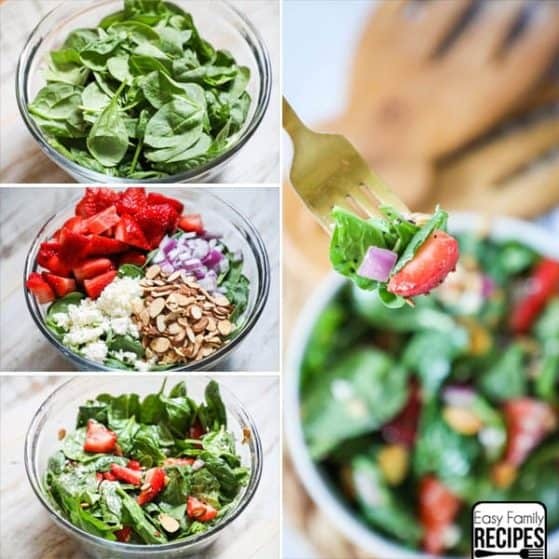 Strawberry Spinach Salad – Perfect and healthy! Oven Roasted Asparagus– So good and SO EASY! 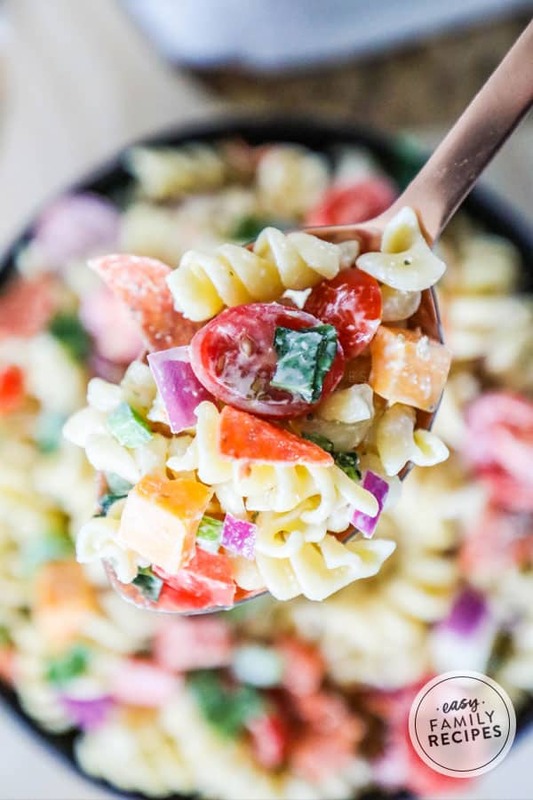 This pasta salad is perfect for entertaining, picnics, potlucks, or just every day at home. The flavors are fresh, delicious, and perfect for a flavorful lunch, or dinner side. Cook the pasta per package directions. Drain pasta and run under cold water, then place pasta in a large bowl. I prefer this homemade creamy Italian dressing for this salad. It has a TON of flavor and is really easy to make. If you are short on time, you can use your favorite bottled Italian dressing. Make sure to get a good quality dressing as the flavor of the dressing will greatly impact the flavor of your salad. Leftovers can be stored in the refrigerator for up to 3 days. To prep ahead, cook pasta and store in the fridge in cold water. Prep all ingredients and store separately. When ready to serve, drain the pasta and then mix with remaining ingredients. 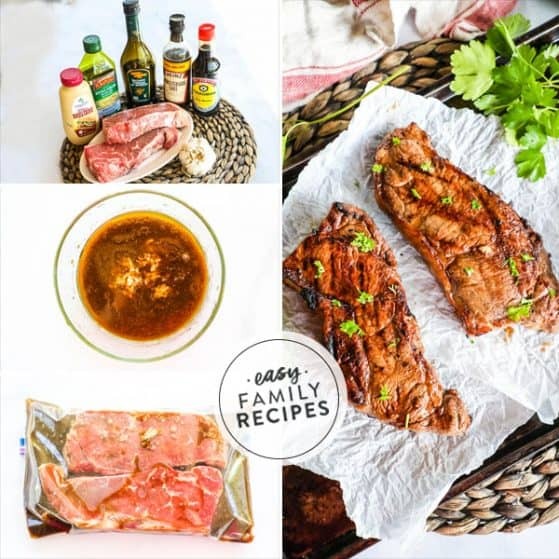 Quick Steak Marinade – Tender & Juicy!